This toolkit was designed to support community organizers and activists in engaging in dialogue on the Prison Industrial Complex. This curriculum was informed and inspired greatly by the Chicago PIC Teaching Collective, Critical Resistance and The Real Cost of Prisons Project. We aim to add to these excellent resources tools that will bring more rural voices into this work. This toolkit focuses specifically on the Prison Industrial Complex in Central Appalachia in order to examine the particular nuances of prison growth in this region, including how it intersects with trends and practices in the coalmining industry. We aim for this work to support deeper dialogue and solidarity between the rural and urban communities most impacted by the Prison Industrial Complex. What is the significance of where prisons are built in the United States? What are the connections between coal mining in Appalachia and prison growth? How are people incarcerated and their families affected by prison growth in Appalachia? How have rural “prison-host” communities in Appalachia been impacted by prison growth? 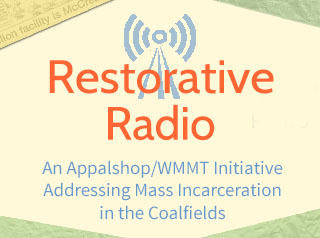 Julia Taylor wrote this curriculum, in partnership with Elizabeth Sanders and Sylvia Ryerson of Appalshop/WMMT radio and members of CAPSN, the Central Appalachian Prisoner Support Network. We encourage the open use and distribution of this toolkit, welcome feedback and would love to know how it’s being used. Write us at [email protected]. These are either original activities, or modifications of activities learned in the community arts field. Facilitators are encouraged to make them their own – add discussion and reflection questions that are specific to your group and/or modify the directions of an activity to meet your group’s needs. They are also written to incorporate a variety of learning styles and levels of engagement with the core issues. Bear these objectives in mind as you use the material. The core of this workshop is listening to the audio and using it as a point for reflection, discussion, and action. All activities should be scaffolded to support participants in actively listening to the audio clips, engaging with perspectives that may be different than their own, and engaging in dialogue. Facilitators should ground their workshop objectives in the goals and interests of the community group hosting the workshop. These goals should help determine which activities are chosen throughout. Section four in particular is meant to be a space for the facilitators to build out the specific takeaway for the session. What is the PIC and how does it relate to central appalachia? Objectives: Getting to know each other (who we are, why we’re in the room, what we want out of the workshop, etc. ), including our initial perspectives and opinions about the prison system and our relationship to it; practicing being active listeners. Sit in a circle. Each individual in turn says their name, where they’re from, what brought them to the workshop. Facilitator notes: Choose a prompt that is appropriate for your group/setting. Facilitator notes: Determine appropriate categories for who you know is in the room. Try to ensure that everyone falls into one of the categories. Turn to the person sitting next to you, introduce yourself (name, where you’re from). Choose which person is A and B. Facilitator determine which person begins (A or B). That person speaks for 1 minute about what brought them to the workshop (or any other such introductory prompt). The other person actively listens without interruption. Facilitator switches the speaker. Popcorn responses from the large group to hear a few samples of what was said/heard. Facilitator notes: This activity is about active listening and being present with a partner. Encourage participants to listen with their whole selves and to be present with the speaker until time is called. If the person is done speaking before time is called, both partners should stay in the silence. The speaker can always begin speaking again in their allotted time. Facilitator notes: Either the facilitator can make all the statements, or, if you feel confident that the group can add on appropriate statements, then invite them to do so. If so, try to encourage people to only offer 1 or 2 statements, so that a variety of people can offer them. You can remind people at the beginning about how negative body language/facial expressions can impact others in the group, and so to be mindful of their own when hearing the statements read. Also, no one has to cross the room. It is each individual’s choice if s/he crosses and no one will call out another for crossing or not crossing. Materials needed: An empty space in which you can assign four corners. Facilitator notes: People might have a hard time choosing one corner. Encourage them to commit and support them in that process: â€œIt doesn’t define your entire life, just try out a category for this moment.â€ Encourage folks to change corners if they are so moved by each other’s comments. You can follow up each statement with whatever form of discussion you desire (talk in small groups in their corners and share back, have a large group discussion, etc). Encourage active listening. Each corner should get a chance to share out before any cross-talk or debate is opened. 2. What is the Prison Industrial Complex (PIC) and how does it relate to Central Appalachia? Objective: To develop a common understanding of what the prison industrial complex is, including its component parts, and how it relates to Central Appalachia. Note: If using more than one activity in this section, make sure they build off of one another. What’s missing? What did we not include on our map? Write their answers on the side of the board, or at a specific point on the map if possible. This is the PIC. Ask participants if they can articulate a definition of the PIC given what’s there. Write up responses. â€¨â€¨Through its reach and impact, the PIC helps and maintains the authority of people who get their power through racial, economic and other privileges. There are many ways this power is collected and maintained through the PIC, including creating mass media images that keep alive stereotypes of people of color, poor people, queer people, immigrants, youth, and other oppressed communities as criminal, delinquent, or deviant. This power is also maintained by earning huge profits for private companies that deal with prisons and police forces; helping earn political gains for â€œtough on crimeâ€ politicians; increasing the influence of prison guard and police unions; and eliminating social and political dissent by oppressed communities that make demands for self-determination and reorganization of power in the US. Materials needed: A chalk/white board, or large butcher paper, and markers/chalk. If the group is large, have multiple spaces for small groups to work simultaneously; Critical Resistance definition of the PIC. Facilitator notes: Doing this activity in silence (conversation through offerings on the board), people who might not speak up in a vocal activity might find themselves more free to add to the conversation. Encourage participants to be conscious of taking turns writing and being mindful of their space. Don’t rush participants in each level – oftentimes taking a step back and thinking can lead to new ideas. Write a prompt(s) on the board. Participants respond by writing ideas/phrases/comments/drawings on the board – can show agreement by putting a check next to someone’s idea, or writing a response or question to further conversation. After the board is generated, invite participants to take a step back and look at it all. Ask for a volunteer to reach each section. Participants can ask for clarification on anything that is written on the board. Discuss what is interesting/surprising/etc to them. What stands out? Who is impacted by prisons? Materials needed: A chalk/white board, or large butcher paper, and markers/chalk. If the group is large, have multiple spaces for small groups to work simultaneously. Facilitator notes: You can encourage silence, or not. Encourage participants to be conscious of taking turns writing and being mindful of their space. General discussion: What was surprising or interesting about what you saw? What stood out to you? Have participants stand next to a posting they find particularly intriguing/relate to/etc. Gather with a few people around you/with people who are near similar images. Move into a small group discussion from there. Place post-its around the room and tell participants that they can write down reactions/responses to the postings on the post-its and place them next to the postings. Participants can comment on/repond to post-its from others, as a form of silent conversation. Build the world together: Gather participants back together and select a couple of rich images. Ask questions to generate collective knowledge about the context (e.g. What do people do for a living? What kinds of resources might be available to people in this place? Why do you think this is a region that has experienced high rates of prison expansion?). Materials needed: Photos/images/quotations/statistics to post around the room, tape, post-its, pens, a room with accessible walls space. Facilitator notes: This activity is a visual entry-point into the world of the audio that participants will listen to. It allows for a lot of creativity and decision-making on the part of the facilitator. The activity can be as simple as participants moving around the room and looking at images followed by a brief discussion, or as complex as developing characters for a large group role play based on the images. Regardless of method, keep in mind the objective of building the context of the region. In the selection of postings, try to represent a variety of perspectives and images. Observation of this diversity is a step towards listening to a diversity of perspectives in the next section. What did you notice in what you looked at/read? What, if anything, did you find interesting, surprising, or confusing, about what you looked at? Materials needed: Statistics or images, printed. Facilitator notes: The cards can be the same as the Gallery Walk cards. This form just operates more quickly. People will not have a chance to experience all of the information, but hopefully will have meaningful reflection within their partnerships. Objectives 1) To listen to the voices of a variety of people about the impact of the prison system on them and their communities; 2) To complicate the picture of who is impacted by the system, and how they are impacted; 3) To practice listening to perspectives different than our own. Play each audio clip and invite participants to actively listen to them. Participants can be seated in one large group, or divided into small groups. Facilitator can pose discussion questions after each clip (and have small groups/pairs discuss responses), or play clips all together and have participants discuss all of the material at the end with larger discussion questions. Materials needed: Audio clips, player/speakers, discussion questions. Facilitator notes: Remind participants that they have been practicing the skill of active listening throughout the workshop and here is a chance to take it deeper. While they may not agree with every perspective that they hear, it is a chance to listen to those perspectives and notice what ideas or questions it raises for them. After listening to the audio, divide participants into small groups (5-6 people). One at a time, participants will tell their own personal, social, or political story based on a given prompt, for a set amount of time (~3-5 minutes). The other members of the group will actively listen to the story being told (rather than thinking about their own story), without interruption, comments, or questions. Pass the stories around clockwise. An individual can pass if s/he wants to, and the group can return to this person at the end. After all participants have shared their stories, they can ask questions, reflect on commonalities or differences, etc. Prompts should be connected to the content of the audio pieces. Tell a story about how the prison system has impacted your family or community. Tell a story about how you have seen your hopes or interests for your community become a reality. Tell a story about how community development in your community did not follow your hopes or interests. Time: 30-45 minutes depending on size of groups. Materials needed: Space for small groups to sit together. Facilitator notes: Look to the work of Roadside Theater or Junebug Theater for history of Story Circles. Emphasize active listening and being present for the speaker. Objective: To create together, to move from reflection to action, within the workshop. This section of the workshop is a place for facilitators to directly connect the goals of the group with the process they are in. Facilitators are encouraged to be creative in how they approach this section. It might be the space for connecting to specific campaigns, creating an artistic response to reflections, building alliances between groups, or any other such goal or interest. The activities below are a sample of possibilities and should be tailored to the specific group’s interests. Note: Not all groups will be ready for this step. Facilitators must pay careful attention not to put action on the group when they are not in a place for it. Materials needed: Paper and pens. Facilitator notes: Calling it a poem might scare off people who do not consider themselves poets. Be intentional in your language, and also remind participants that this exercise is not about poetic talent, but is a way to express your personal thoughts with the group. Every voice in the group is essential for the creation of the piece. Also, you can do a multiple stanza poem. Participants write their line for one prompt, and then give them a second prompt. Each person reads his/her first prompt line one by one, and then read the second prompt line one by one. If this group poem is recorded, use it as a further organizing tool. Time: 15 minutes (5 minutes to create, 10 minutes to share). Materials needed: An open space for groups to work. Facilitator notes: Presenting groups will often want to tell what their intention is for their images. Discourage this in favor of reflections from the audience. It allows space for many interpretations. Write letters to your local officials explaining your opinion on the prison system in central appalachia. Have a plan to send these letters (either via email or mail). Start as a large group brainstorming ideas/content of letters, and then write letters individually or in pairs/small groups. Materials needed: Paper, pens, envelopes, or computers with email, addresses of officials. Facilitator notes: Facilitator should connect the specific goals of the partner group with this letter writing activity. Letters could connect to support for local campaigns, such as the restoration of voting rights for former felons. Facilitator notes: Choose a prompt that grows directly out of the objectives and process of the session. Davis, Angela (2003). Are Prisons Obsolete? Choose the audio clips that will best serve your group, based on their prior knowledge and/or interests. Use the descriptions below to introduce each piece. What stood out to you from what you heard? What, if anything, surprised you about what you heard? What voices, if any, could you relate to? What do these clips make you think about the role of prisons in central appalachia? What emotions or sentiments did you hear these people express? What do these people hope a prison will do for their community? Why do you think they felt this way? Given what you heard, what are some of the impacts that working in a prison has on the individual, his/her family, and/or community? The speaker says “we are being exploited once again.” What might she mean by this? What emotions or sentiments did you hear in these calls? What might be the impact of these calls on the callers and on the people who hear them (inside and outside of the prison)? What are the limitations on prisoners and their families in terms of communication? Additionally, for the strike audio: What might be the impact of these calls regarding the strike on the people who hear them (inside and outside of the prison)? How might they impact the goals and process of the strike? What other means of communication do you think the people on strike had? How does the prison industrial complex impact central appalachia? What does this mean for the future of central appalachia? (for the specific people/community in the room?) What does this mean for the future of American communities, both urban and rural? Why are prisons being offered to towns as economic development options? What does this say about our local or national values?